Towards the end of last summer, I spent a day in London with my brother, Richard, and sister-in-law, Lisa (and bump, who is now, of course, known as Noah!) I never got round to sharing my trip with you on here and as I’m trying to get all those blog posts written that I’ve had sitting around for ages, I thought today I would chat to you about what we got up to! Our first stop was Borough Market, which I had never investigated before and was soon left wondering why I’d left it so long. I must admit it was a little scary going round in a wheelchair because it was so busy that all I could see were people’s legs and stomachs! But I’m fairly used to that now, so it didn’t bother me too much and I was soon getting caught up in the atmosphere of the market. It was a bit of a rainy day, but thankfully most of the market was under-cover. So we just pottered around the different stalls, eyeing up all the amazing looking foods and being overwhelmed by the insane smells of cooking. I would list all the things we looked at, but to be honest I think it would be easier to tell you which produce we didn’t see! 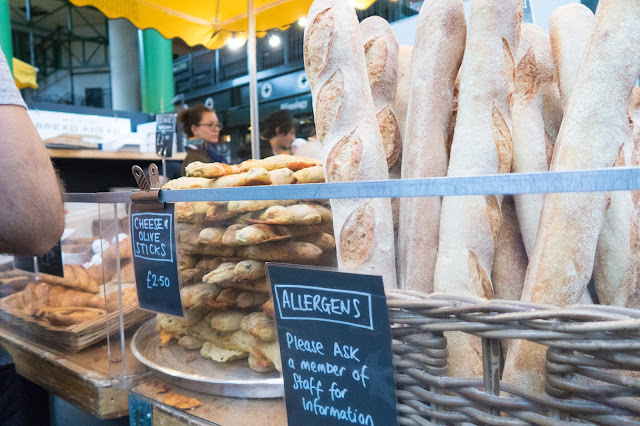 There was something for everyone – whether you want freshly baked bread, fresh fruit and vegetables, an amazing selection of cheeses or something sweet. There were even stalls specialising in gluten and dairy free products, which caught my attention. We didn’t end up buying much – there was a shop with loads of different cheeses, which let us try some of them (and my brother bought one of his favourites) – they tasted amazing! And I found delicious balsamic vinegar in an oils store, which we all ended up buying a bottle of! But the fun was mainly in just looking around, trying samples and seeing the variety of things on offer. I really want to go back! We also caught a view of The Shard, which is another place I would love to go one day. 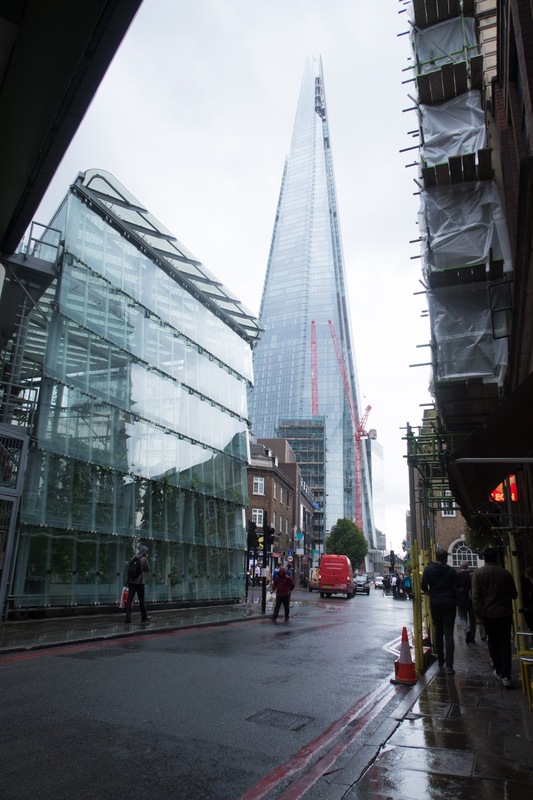 After our adventures around Borough Market, we made our way across London to Belgravia (which took a while with us trying to find tube stations that had disabled access). Thankfully the weather had brightened up, so as we walked/I wheeled through the gorgeous white houses of Belgravia we were really able to take everything in and enjoy imagining the kinds of people that lived in the cute little roads off the main road. 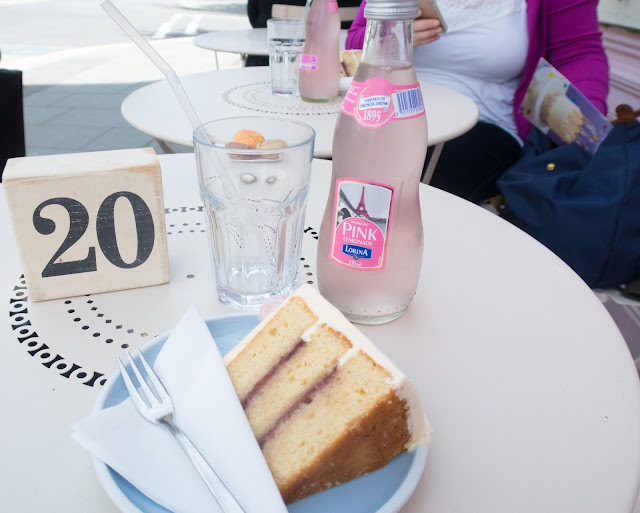 Our main aim of the trip was to have tea and cake at Peggy Porschen - my gift to Lisa for her birthday. If you’ve never heard of Peggy Porschen before (where have you been?!) it’s a favourite amongst bloggers for photos, but also sells the most gorgeous looking cakes. 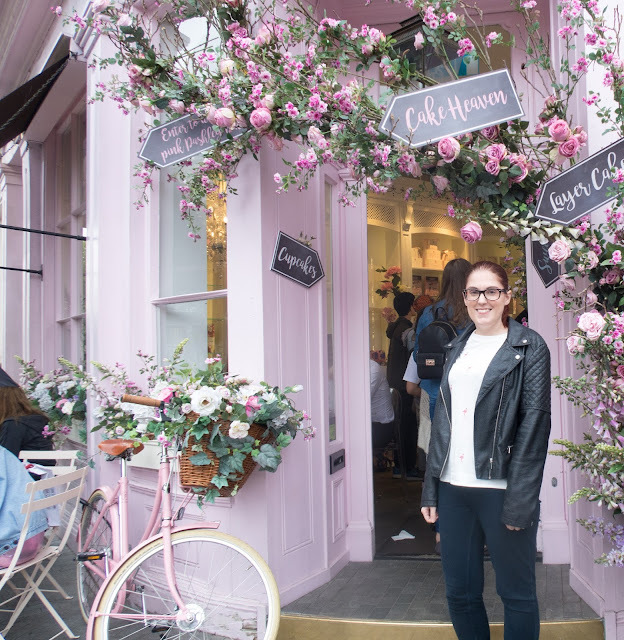 We soon spotted the famous pink parlour across the road, with a selection of whom I can only assume were other bloggers taking photos in the legendarily decorated doorway. We were a bit worried about not being able to find anywhere to sit, as there are only a couple of tables inside, with a few more outside, but luckily one was available outside by the window. As I was able to get out and walk a bit with my stick, Lisa and I headed inside to take a look at the cake counter. 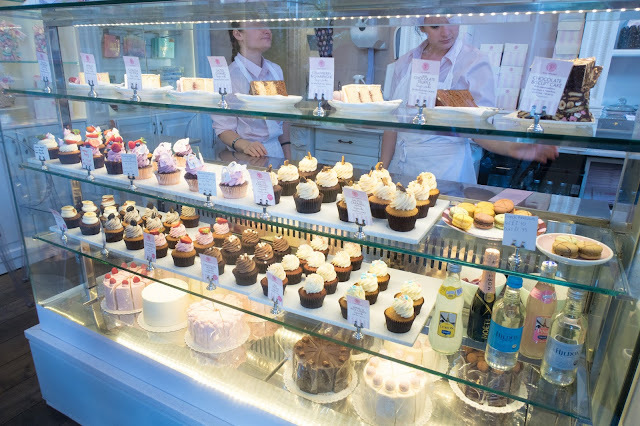 There were so many yummy treats to choose from – we had real difficulty deciding what to go for! 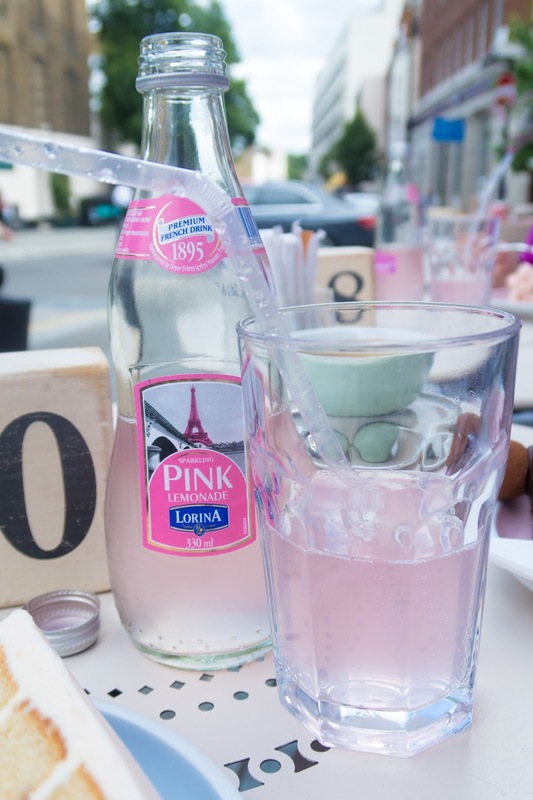 From chocolate truffle cake to salted caramel cupcakes, everything looked so perfect with the little pink labels on each treat. There were also teas; coffees, hot chocolates and cold drinks to choose from, and again, it took a while to make a decision on which to go for! In the end, I went for pink lemonade, to match the décor of the shop, a generous slice of Strawberry and Champagne Layer cake and three macarons for us to share. 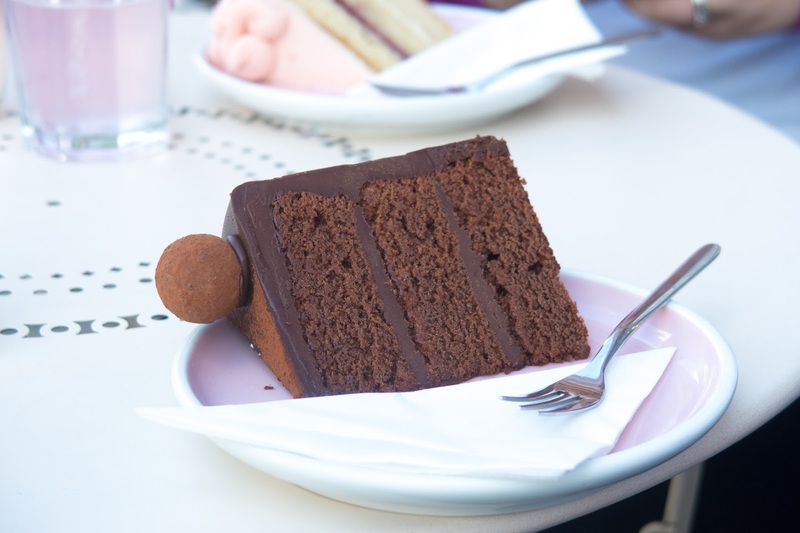 Richard opted for the Dark Chocolate Truffle Layer cake, and Lisa went for the Glorious Victoria Layer Cake. 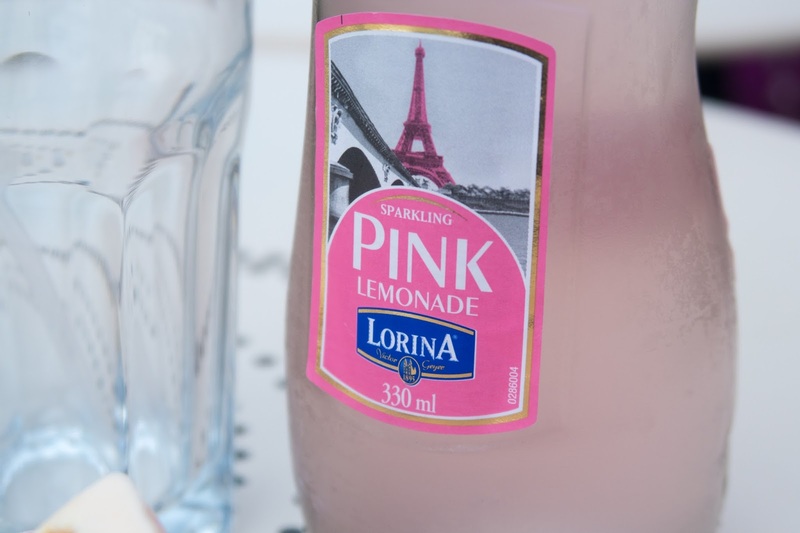 I can vouch for everyone when I say it was all so yummy! 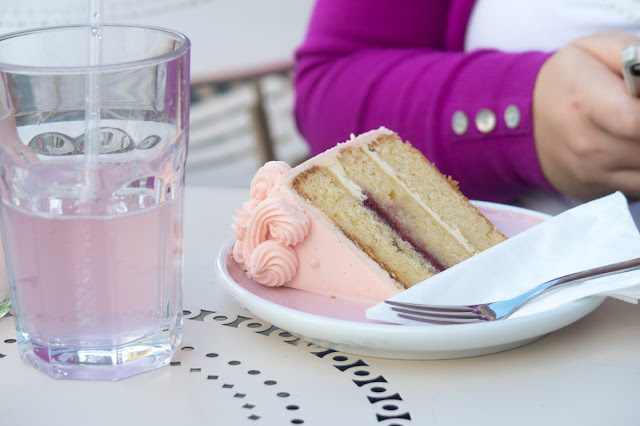 The cakes were light and fluffy, with mine having a strawberry champagne truffle to finish it off. 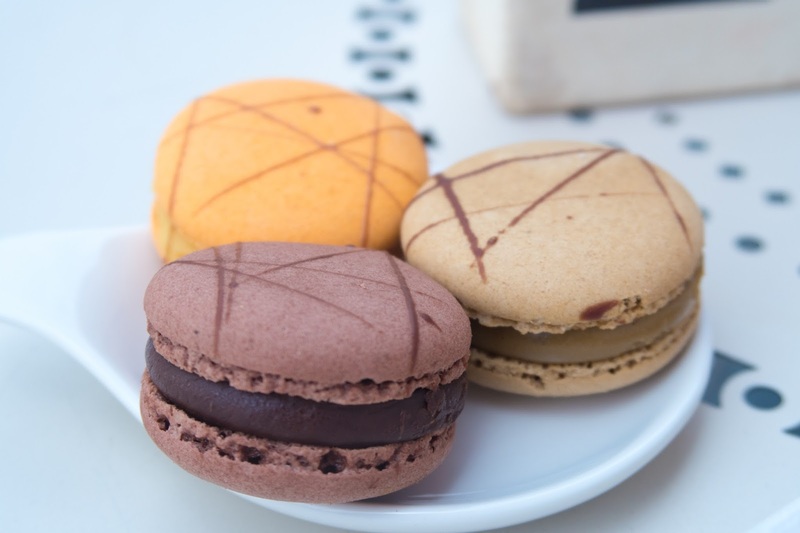 And the macarons were a pretty good match for my favourites from Ladurée – I didn’t really want to share them! The menu does change from season to season, so you can find the latest options here. 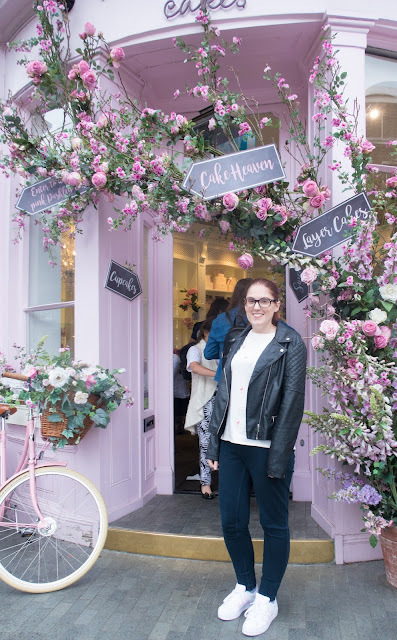 As well as the delicious drinks and cakes, you can’t eat at Peggy Porschen without getting a picture or two of the beautiful flowers and decorated doorway. 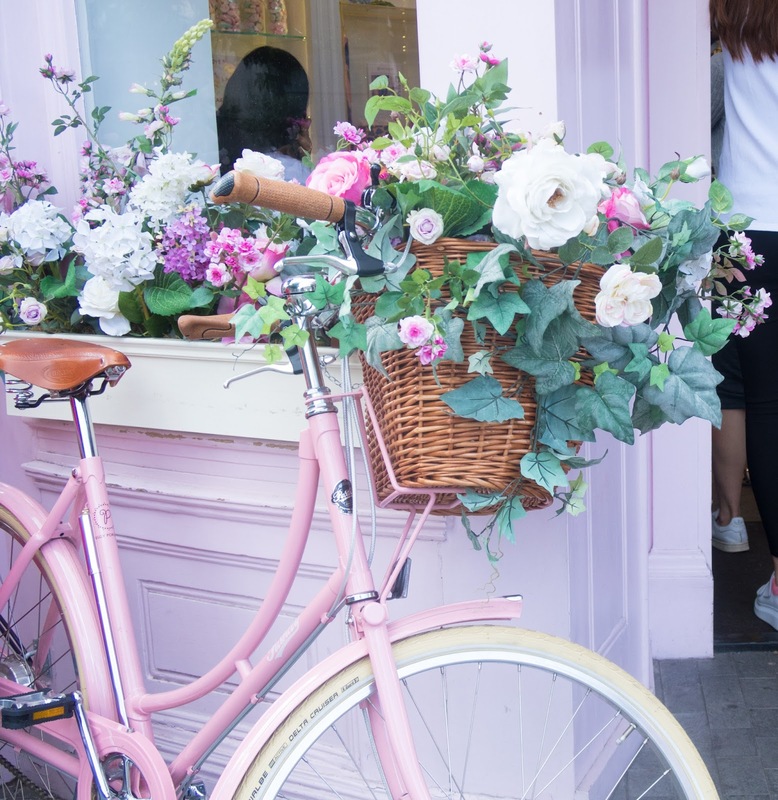 As it was summer, the door was surrounded by stunning fake flowers in every shade of pink you can possibly think of. The outside décor changes with the seasons, and I’ve heard they have a fantastic Valentine’s display at the moment, which I wish I could go up and see. Luckily we were able to get a few photos before the heavens opened and the rain started falling. It was pretty busy, so we had to wait for a few other people to have their photo taken first, but it wasn’t too long. I can definitely understand why bloggers love to use Peggy Porschen for photography products. 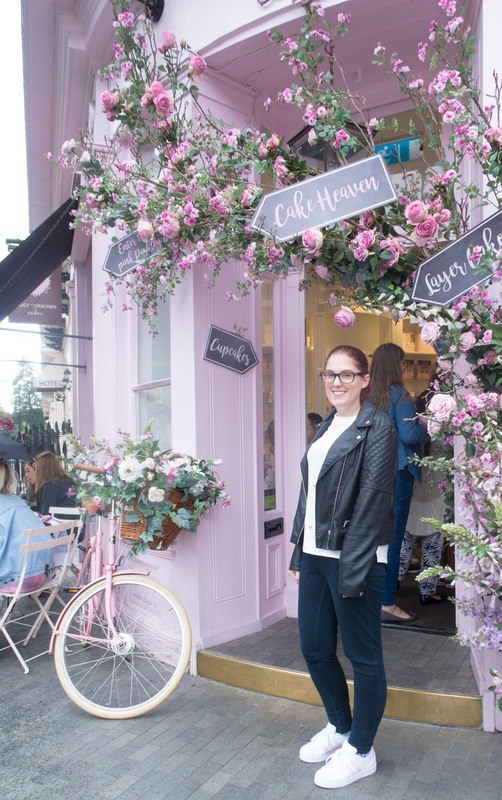 It’s the definition of girly and if I had a tea room (which is always something I’ve dreamed of!) it would definitely look like this! 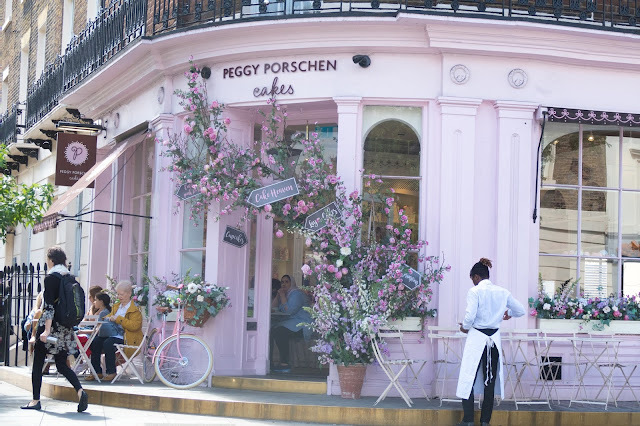 Have you visited Borough Market or Peggy Porschen before? 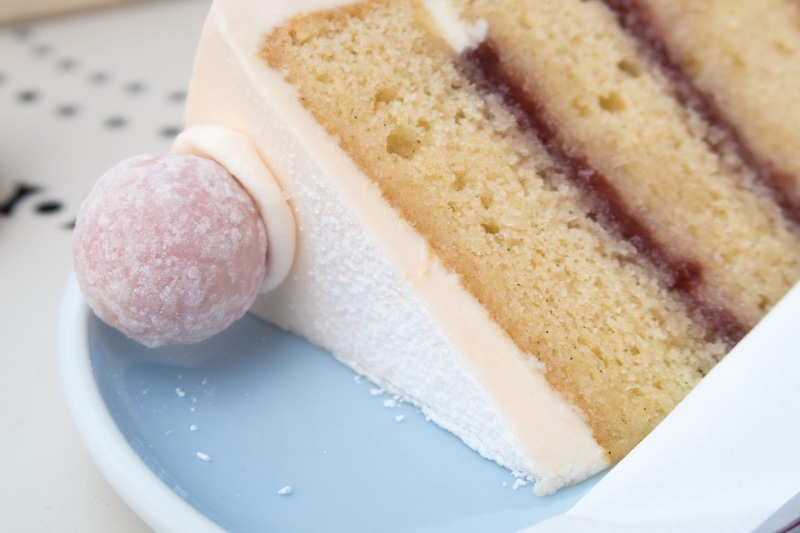 What is your favourite cake from their counter, or is it too hard to choose? !